The DUP has accused the PM of breaking promises over plans to avoid a hard Irish border post-Brexit. The party reacted angrily to a letter from Theresa May to DUP leader Arlene Foster, leaked to the Times. In it, Mrs May explains the EU wants a contingency of Northern Ireland staying in a customs union if no border solution is found during the post-Brexit transition period. 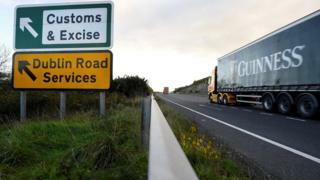 Negotiating a backstop – an insurance policy to keep an open border between Northern Ireland and the Republic of Ireland until the UK and EU agree their future relationship – remains the main obstacle in the way of a wider agreement between the two sides. If sufficient progress is made on the issue in the next few days, it is thought a special cabinet meeting could be held early next week for ministers to approve the draft agreement on the terms of the UK’s exit. Culture Secretary Jeremy Wright told the BBC that “these things take time to get right” and Mrs May should be given the space to do a deal which protects the UK and Northern Ireland’s interests.